In an era of comparatively low gas prices, full-size body-on-frame sport utility vehicles like the 2017 GMC Yukon have found a new life beyond shuttling celebrities around town. The Yukon debuted for the 1993 model year and over time has morphed from a boxy 3-door hulk that replaced the family station wagon into today’s handsome, versatile, capacious, and go-anywhere 5-door family hauler. It seats up to 9 people (with various seating configurations available) and features a cargo capacity measuring 97.4 cubic feet with the rear seats folded. Be aware, though, that this sport ute’s size, old-style leaf springs, and solid rear axle will mean a shaky ride and some potentially awkward handling. A close relative to Chevy’s full-size Tahoe, the Yukon differs in trim designations, offering the SLE and SLT. 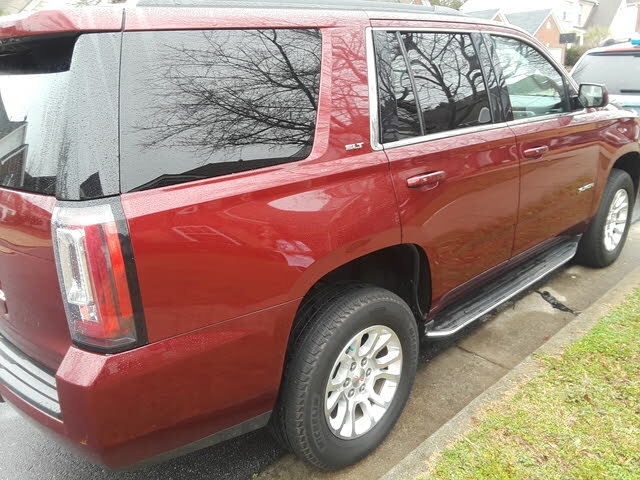 Like the Tahoe, each Yukon edition comes with standard rear-wheel drive (RWD), but a part-time 4-wheel-drive (4WD) configuration, boasting a 2-speed transfer case and low-range gearing, is an option for handling wintry weather or even off-road adventures. After a complete redesign for 2015, the Yukon lineup gets only minor upgrades for 2017. These changes include a new exterior color, Dark Sapphire Blue Metallic, standard heated and ventilated front seats to replace the heated and cooled seats in the SLT, and a set of slick 22-inch, 7-spoke silver wheels with chrome inserts. New front active aero shutters, hidden low behind the grille, are expected improve aerodynamic performance by automatically closing at highway cruising speeds and opening when engine cooling is needed. GM’s Teen Driver programmable safety system will also be integrated into the vehicle's IntelliLink infotainment and telematics feature. New additions to the available rear-seat entertainment system for 2017 include a voiceover feature for the visually and hearing impaired, digital headphones, enhanced 4G LTE WiFi hotspot projection capability, and a second USB port. Standard power for both 2017 Yukon trims will be a 355-hp 5.3-liter V8 that combines with a 6-speed shiftable automatic transmission to put out 383 lb-ft of torque. Look for a 8,500-pound towing capacity with the standard hitch and wiring, while an integrated trailer brake controller comes optional. Currently, EPA mileage estimates run 16 mpg city/23 highway/18 combined for RWD versions, with 4WD trims dropping highway mileage to 22. Expect a 0-60 mph time of 7.3 seconds, which isn’t bad for a ute this size, though Ford’s Expedition and Toyota’s Sequoia each beat the Yukon with times of 6.5 seconds and 6.9 seconds, respectively. Look for the 2017 Yukon to sport a high-end interior heavy on soft-touch surfaces and quality materials. The improved IntelliLink infotainment and telematics system is intuitive and easy to use, while gauges and controls are legible and within easy reach. Front and second-row seats are comfortable and supportive, and the second-row seats are power-adjustable for easy access to the third row. Now comes the bad part: those third-row seats are uncomfortable even for preteens--with the bottom cushions positioned low to the ground, third-row passengers are forced to view life from between their knees, and shoulder room isn’t as spacious as it looks from the sidewalk. And while these way-back seats were recently upgraded to fold into the floor, the high cargo deck might demand some extra grunt when loading heavier items. One of the Yukon’s handier features is a unique rising center display that hides a small storage cubby beneath. You’ll find a USB port in the cubby, which is large enough to stow a smartphone, a pair of glasses, or even a change purse. Three further enhancements to the Yukon include an LCD driver information display, active noise cancelling in combination with the audio system, and improved soundproofing to keep engine, wind, and road noise to a minimum on the inside. Standard seating for each trim includes bucket front seats and second- and third-row bench seats for 8-passenger capacity. Second-row bucket seats or captain’s chairs are available on both trims, cutting capacity to 7 passengers, while both can also be delivered with available front bench seats for 9-passenger capacity. Options for 2017 include an integrated trailer brake controller, a power sunroof, GPS navigation, and the newly enhanced rear-seat DVD/Blu-ray entertainment package. And look for the available SLT Premium Edition, which debuted last year, to again offer polished exhaust tips, a unique chrome grille design, bright chrome body-side moldings, and distinctive 22-inch chrome wheels. Standard safety equipment is slated to include antilock braking (ABS), front side-mounted airbags, 3-row head curtain airbags, front and rear parking sensors, a rear-view camera, OnStar emergency telematics, and traction and stability control. An Enhanced Driver Alert package is new for 2017 and boasts low-speed forward automatic braking. Optional safety equipment includes adaptive cruise control with emergency braking, lane-keeping assistance, blind-spot warnings, and a forward-collision alert system. The available Enhanced Security package offers a theft-deterrent alarm, vehicle incline sensor, and vehicle interior sensor. In government crashworthiness tests, the current Yukon gets 4 out of 5 stars for overall safety, with 5 stars awarded for frontal-impact protection and 3 stars awarded for rollover protection. GMC’s 2017 Yukon, a direct descendant of Chevy’s legendary Blazer (and now in its fourth generation), is expected to lag behind the competition in ride and handling characteristics, thanks to its truck-based frame. Some folks might be better off getting a large crossover like the Dodge Durango, but this Jimmy’s towing capabilities, rugged build, and spacious interior are worth a serious look. Currently, the no-frills SLE goes for $48,315, while an SLT with no extras starts at $57,000. What's your take on the 2017 GMC Yukon? Users ranked 2017 GMC Yukon against other cars which they drove/owned. Each ranking was based on 9 categories. Here is the summary of top rankings. Have you driven a 2017 GMC Yukon? I recently stopped my lift gate from opening so that it would not hit my garage door and ever since then I have to manually open my lift gate. What’s the recommended oil for a 2017 Yukon?